Restricting this to just 10 things has been difficult. Below are five of my favourite Corsican things, places or experiences: find the next five here. They are all part of the landscape/history/culture that inspired The House at Zaronza and will continue to inspire my future writing about Corsica, whether fiction or non-fiction. The hairs on the back of my neck stood up as I gazed into the faces of these mysterious warriors, staring back across the millennia. Opinions vary as to who they were, but it seems likely that they were invaders rather than natives and that capturing their images in stone was intended in some way to disempower them. Corsican polyphonic singing is an elemental and primal sound and is part of the distinctive character and culture of Corsica. Some might say it’s an acquired taste, but I think it’s fantastic and it speaks Corsica to me. Last year we went to a concert by a group called Meridianu www.meridianu.com in Corte and I was spellbound. Here’s a clip from one of the best known groups, A Filetta, who have made an international name for themselves. Corsica has rarely been independent throughout its history. For centuries it belonged to the Italian city state of Genoa before they sold it to France. But before that it belonged to Pisa. The charming and intimate little churches are one of the legacies of the Pisan occupation. This is my favourite, the church of San Michele at Murato in the Nebbio, in the NE of the island. A frieze of mythical beasts and Biblical scenes adorns the upper walls. I made a point of mentioning it in The House at Zaronza. This town, in the centre of the island, is symbolic of Corsica, for it was here that the visionary Pasquale Paoli established the short-lived Corsican republic in the 18th century. It has a faded, dusty grandeur and is the gateway to some marvellous mountain walks and scenery. Now the island’s only university, it is lively and buzzing and somewhat cheaper than the overpriced coastal resorts. We can’t keep away. This is the collective name for the scrubby, aromatic vegetation that clothes the Corsican hillsides: rosemary, lavender, cistus, juniper and myrtle. Native Corsicans returning to the island by sea claim they can smell it several miles out. Corsican bandits d’honneur, those who had committed a vendetta murder, took to the maquis to evade capture. During World War II, the maquis served again to hide resistants. And it eventually gave its name to the resistance movement in France. In The House at Zaronza, the main character, Maria Orsini, drinks in the scent of the maquis before taking the boat at Bastia to nurse at the Western Front during World War I. In the process of writing this post, I’ve thought of so many more inspiring aspects of Corsica, which I will share over the coming weeks. In the meantime, we are preparing our 6th visit this September and I am planning the sequel to The House at Zaronza, in which Corsica will again feature strongly. This entry was posted in Corsica, Historical Fiction, Novels and tagged Church of San Stefano, Corsica, Corsican polyphony, Corte, Filitosa, historical fiction, Maquis, Murato, Pasquale Paoli, Pisan churches in Corsica, The House at Zaronza by nessafrance. Bookmark the permalink. I stumbled across your blog and have now started to follow you. It is a Dream of mine to visit Corsica. My dream will become a reality in late september/early October…..I will only have 5 days there so am going to cram as much as possible in. I have never really travelled out of Australia, I do not speak French and am travelling alone…..I am a little nervous but so very excited to see this place I have dreamed of for so very long!!!! I will be reading your blogs to try to get some handy tips!!!! Thank you for following. I hope you enjoy your stay in Corsica. I’ve been there six times and it’s a beautiful and fascinating place. Don’t worry too much about not speaking French. Just take a French phrase book and learn a few phrases. It never hurts to say please (s’il vous plaît) and thank you (merci) a lot! Do come back to me if you have any questions about Corsica. I really appreciate your offer. I am sure I will have many questions! ALSO….I LOVED Paris!!!!!!!!! I’m sure everybody says that, but I absolutely fell in love with the Eiffel Tower! It gave me goosebumps!!!!!! I’m glad you enjoyed Corsica. I haven’t been there for more than 2 years and am missing it! Paris is always great and, however clichéd the Eiffel Tower might have become, it’s still a fantastic monument. Look forward to reading your posts! Lovely and inspiring post, Vanessa. 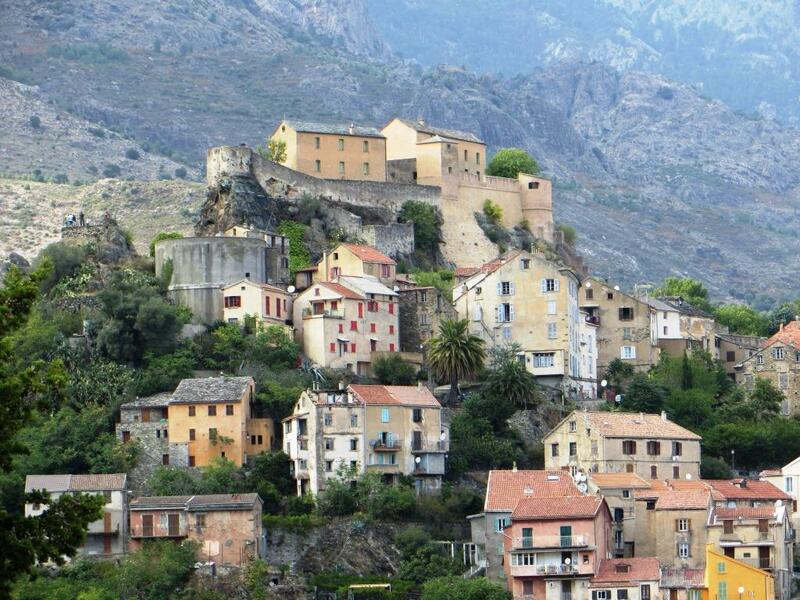 It’s great to read about some of the breathtaking sceneries and villages of Corsica. I would really love to visit one day. In particular, I would love to experience the scents of the maquis for myself. I was once given a pot-pourri of maquis plants and the smell was very unusual. It must be even more wonderful in situ. I am looking forward to your next post! Thank you, Marie. I’m pleased you enjoyed it. The scent of the maquis is incomparable. I will find it hard to restrict myself to 10 things, so I will probably keep posting!